The Type II Faraday Cage offers improved access and simplified assembly. The “window-shade” type retracting front panel is easier to operate than hinged doors and causes less disturbance when adjusted. This front panel may be positioned anywhere between fully opened and closed and stays in position without a fastener. The front door is shipped assembled and the entire unit may be assembled in a few minutes with a screwdriver (provided). This cage incorporates the same stainless steel frame and copper-mesh material as previous versions. It mounts to (and requires) TMC’s full-perimeter enclosures and mounts to our CleanBench™. Our 40 in. 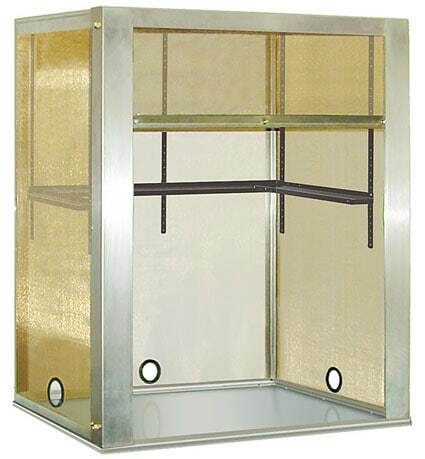 tall Type II Faraday Cages now include a convenient 2 in. diameter hole in the base of the side and rear panels. This feature eases cable interface to the interior of the cage. The hole is sleeved with a rounded rubber liner to shield sharp edges and assure long life. In addition, we now offer a new version of our armrest pads that is compatible with our cages. These armrest pads are virtually identical to our non-Faraday Cage pads but adhere with Velcro straps rather than clips or magnets. 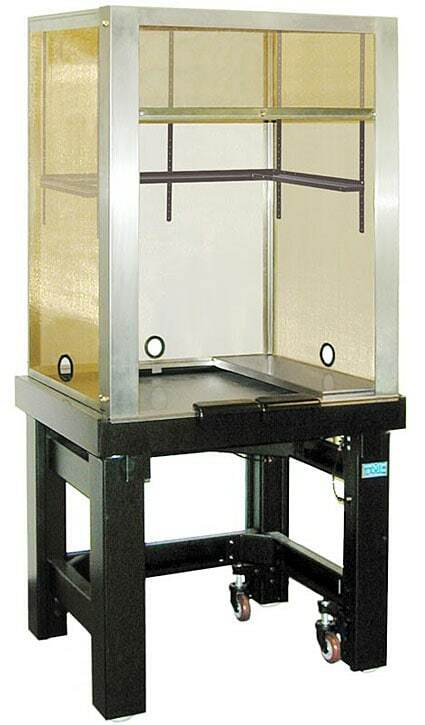 Until recently, our Faraday Cages have only been available as part of a complete TMC vibration isolation table system. The cages required our Perimeter Enclosure option and could not be assembled without a TMC 63-500 Series Vibration Isolation Table as its base. We now offer the same line of 40 in. tall cages with a baseplate which allows the cage to be used on a bench-top without a corresponding TMC table. The base of the cage is a reinforced stainless steel plate which can support a compact vibration isolation system, microscope, or other instrument.